For years I've accepted my being overweight as my curse. I tried everything to lose weight including the popular and fad diets. I approached my doctor about having weight loss surgery only to have my health insurance deem me not sick enough to qualify for surgery. 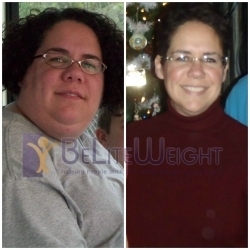 When I heard about BeLiteWeight it was like my prayers had been answered and I decided to go with the gastric sleeve procedure. I approached my husband and even though he was apprehensive about me traveling to Mexico he supported my decision completely. Once I filled my friends in on my decision, it was met with mixed reviews. Although they all supported my decision, they too were concerned about me traveling to Mexico to have it done. Before I knew it the day had arrived for me to fly out to El Paso, TX. I flew on Christmas Day and spent the night at a hotel and the next day I was picked up by the shuttle driver who took me straight to the hospital in Juarez, Mexico. Admittance went very smoothly. I was taken to my own room and had some testing performed. There was a communication barrier with some, but at any time I didn't understand something there was someone who spoke English to explain what was going on. My surgery took place the next day. Surgery was a complete success!! As with any surgery there was pain and discomfort, but very minimal. The stay in the hospital for the next couple of nights was very nice, but I looked forward to getting home. Before leaving the hospital they had to do a post-surgical x-ray showing how my stomach had changed from it's original shape. Following the post surgical diet was a breeze and within the first month I lost 35 pounds*. I am very strict with my portion sizes and try to eat every 3 to 4 hours to keep my metabolism going. I drink at least 48 ounces of water a day. I no longer consume ANY caffeinated or carbonated products. I cannot believe that a year has gone by and I've lost 125 pounds*. I've gone from a size 24 to a size 10! * I thank BeLiteWeight, Dr Rodriguez & Dr. Elmo for giving me the tool for me to get my life back! Before surgery I used to dread going clothes shopping, but now I look forward to trying on clothes! I would highly recommend this to ANYONE! !